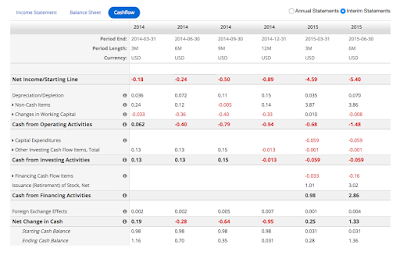 Stock and currency market opinions and reports from trader and analyst David Atherton. 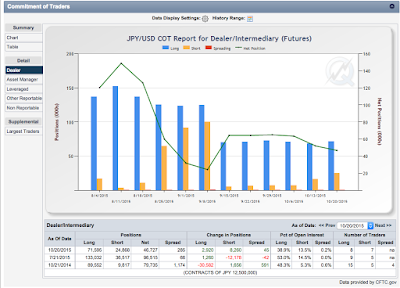 After the Fed minutes on Oct 28th, which confirmed the US rate at 0.25% for another couple of months, there was a sharp spike in the USDJPY pair. However, within hours this had retraced by 50%, before starting to climb again. I notice however that in the last few hours the pair has stalled. Applying parallel tramlines to the last few day's price action explains this, and the pair appears to be at the top of a gentle downtrend. The setup has an excellent risk/reward ratio if my hypothesis is correct, a very tight stop just above the Fed spike high, and a potential reward down to below 120. No point being greedy, as the Fed news spiked down to 120, that is a good point now for a profit target. I have taken three time my normal size because the risk is only 13.6 pips, much smaller than usual. 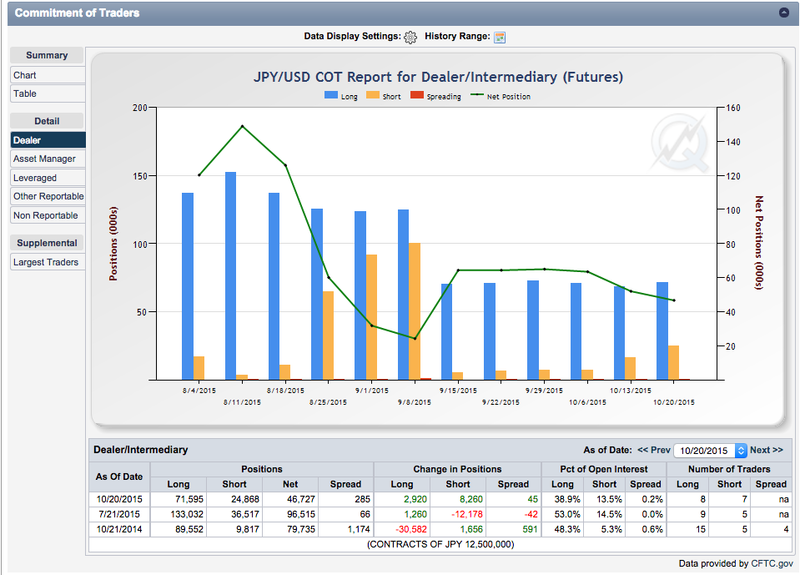 I am therefore confident that USDJPY will return to it's 2015 median of around 120. 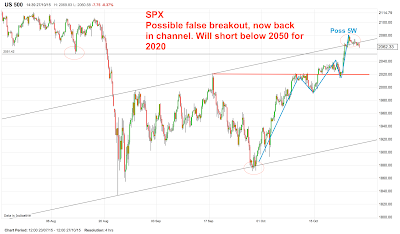 The SPX is showing a possible false breakout here. Will wait until it breaks 2050 support, then short to 2020, next support. Ultimately 1940 is possible. Note also that there is a possibly 5-wave complete EW here, which adds weight to the hypothesis. 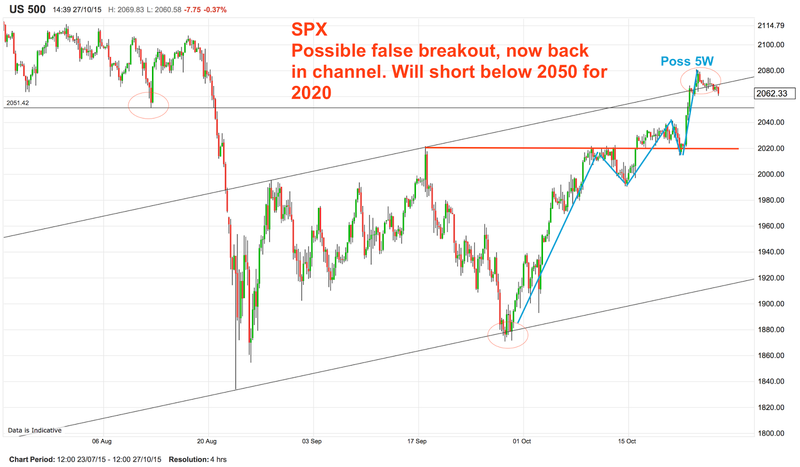 If 2050 holds, we are back in the 2050-2135 channel from earlier in the year, and should trade accordingly. Talk about hype. The IPO price makes TSLA look cheap. 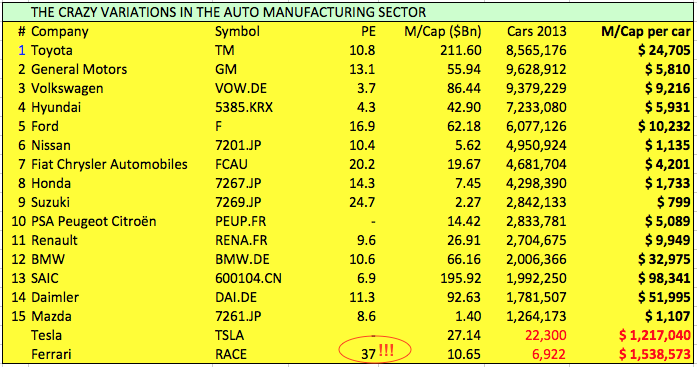 I decided to do a simple analysis of the Top 15 car manufacturers and then add in Ferrari and Tesla, and compare their market cap against number of cars sold. You might ask why I don't measure against revenue or profit, but I did that via P/E. Here's my chart. As you can see, Ferrari is ridiculously expensive by either my 'per car' metric, or simply just on the P/E which is much higher than anyone elses. (The SAIC market cap is a bit of a mystery, Chinese state companies and all that). This chart also highlights that the dust has now settled on the VW scandal, as the other P/Es seem to have recovered. 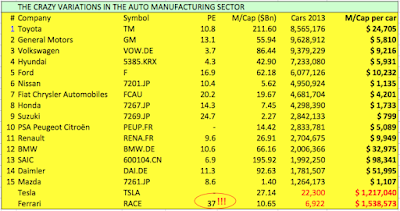 No, I would not RACE to buy Ferrari stock! By the way their cash is declining as their sales rise. Not a good sign. Since the demise of JJB, the UK sports apparel market, which is in practice the entire apparel market for a certain segment of British society, is dominated by two firms, Sports Direct (LON:SPD) and JD Sports (LON:JD). Each has it’s own colourful chairman and unusual activity, but the current share prices are very different, as per the charts below. Both firms have performed traditionally very well, as oligopoly markets often do. However SPD.L is currently oversold (the daily RSI14 is below 30) and also near the bottom of a parallel rising channel. Note the RSI14 over the last two years; it does not stay in this condition for long. I'd prefer to buy at the absolute channel bottom (640p) although I'm happy to recommend a scaled entry from the current market price (652p). As a hedge against this, the competitor, JD.L look exhausted. It has been continually overbought all summer (yellow box, that in itself is interesting), but since the last sharp rise above 800p, has developed a strong negative RSI divergence, but yet is nowhere near oversold. 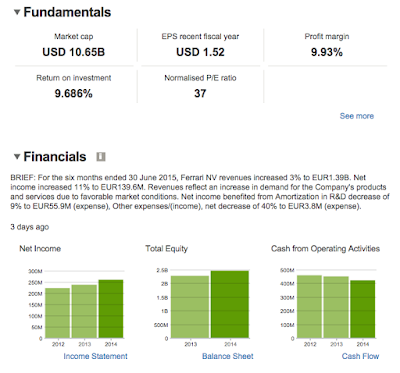 If we look at the fundamental performance of the two companies (below), another disparity rears it’s head. Although SPD.L makes a profit of 8.5% it only trades at a P/E of 16.5, whereas JD.L, with 5.2% margin, trades at a P/E of 23.4. So JD.L is 'more expensive'. Other points are that the SPD.L EPS is higher, despite a lower nominal share price, and a quick glance at the net income chart (the left hand bottom bar chart) shows that SPD.L is growing, whereas JD.L is more static. All this leads me to recommend buying SPD.L here, with a target above the previous high of 820p, eventually leading to the March 2014 all time high of 924p. You may also consider a hedge (perhaps only 50%) in the form of a short on JD.L shares, maybe back to the 887p pivot from August 27th. My GBPUSD long trade of September 25 went well, and hit both targets and closed. My theory still holds so it is now time to go short. Here is my next course extract. Following the same theory as before, the trendline has now been reached and it is time to go short again. Overall, cable is at the top of a bullish descending wedge, however I believe the wedge is not complete yet and there will be another down cycle. Accordingly, I have placed two short contracts. In both cases, my stop is slightly above the upper descending trendline at 1.557. One of the contracts is targeted to reach 1.5170 the low of Jun 1 and Sep 4, and the other is slightly more ambitious to reach a lower point in the wedge, the psychological 1.50. When the first target is hit, the stop on the second target will be lowered. More Essex FTA coursework. The title refers to the last paragraph. This is a very weak instrument. A friend of mine once called it the world's slowest bear market. 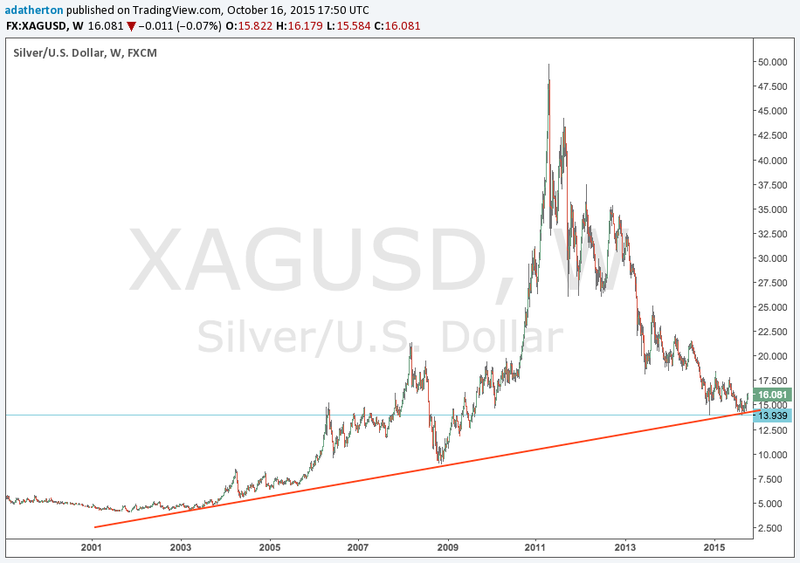 XAGUSD is in a downtrend. It crashed on Aug 24th, unlike XAUUSD which rallied. In fact it made a 6-year low of $13.98 on that date. It is not a safe haven metal like gold, and fundamentally, production is increasing whilst demand decreases In the short term, it will probably rise in the current channel to $16.50 but then come down again. How far down can it go? Looking at the 20 year chart, there does appear to be some support around here, and perhaps this $14 price is a permanent low. I would however, wait until the price hits $14 again before buying (a double bottom). 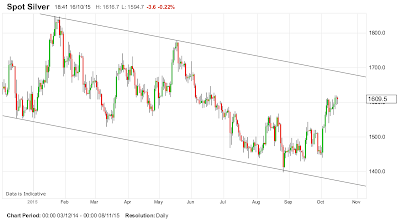 In the meantime, allow the metal to creep to the top of this downward channel and short it. Longs to get to the channel point are possible, as the metal moves so slowly, but I would not recommend. If the price breaks down again, due to fundamentals, below, say $12.50, then after some resistance around the $8, it is perfectly feasible for the metal to hit the price it was for the last 20 years of the last century, viz. $4.50 per ounce. Remember mining and recycling technology are the enemy of metal prices. And technology only goes in one direction. 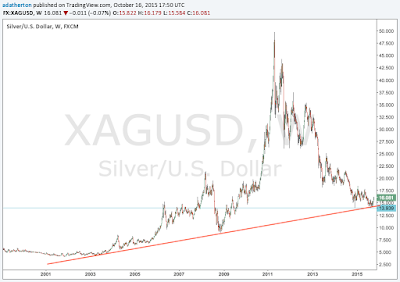 Incidentally, the 20 year chart for silver looks a bit like the Rodrigue bubble chart. World's slowest bubble which does appear to have reverted to mean. Another piece of coursework. Quite long this time, 1700 words. This a great subject, the correlation between stock markets and currencies, and indeed there are many correlations to be found. 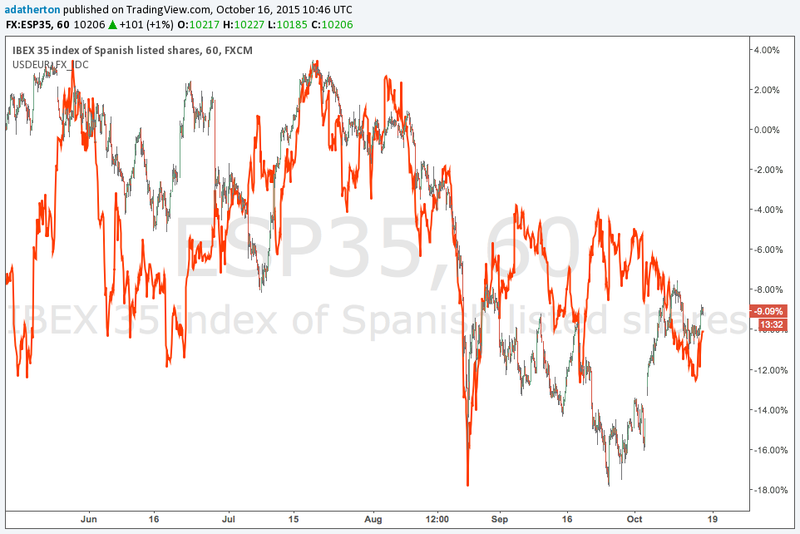 Obviously the useful correlations are only found when the currency lags the index or vice versa. 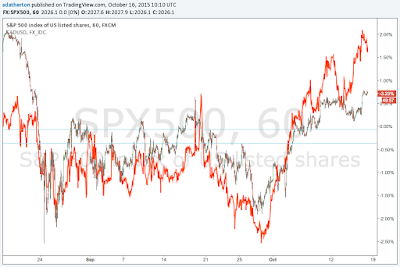 A real-time correlation is of no particular value. There are other indicators which can be found by plotting the charts of world indices in USD, where pivots appear, but of course being single plots, do not offer lagging and leading signs. The correlations work in a strange way. In a 'risk-off' environment (or bearish, or low volume, often seen in Summer), we often see a strong correlation between currency and index, which means that if the index were expressed in USD, price/action would be flatter. Regard the German DAX overlaid with the Euro. 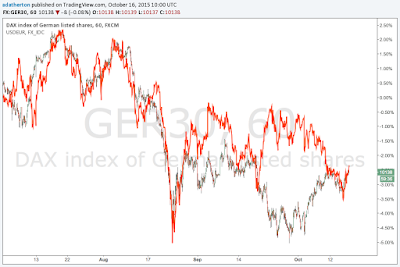 The pair reversed, so USD comes first, meaning that DAX rises are merely Euro falls. You will see that during summer, leading up the August 24th crash, there was an extremely strong correlation, in other words the DAX if denominated in USD hardly moved at all. After the crash, the correlation continued, although not as strongly until the morning of September 18th, at which point the correlation went precisely into reverse. What happened? On 16/17 September, the US FOMC announced for the first time some forward direction on interest rates, namely that rates were likely to rise before the end of 2015". This is real news, and 'trumps' any correlation. A rate rise is risk-on, viz. good for the dollar (obviously) but not good for the stock markets. The German DAX is well known as being the most closely linked to the US dollar, probably because it's component companies are all very big multinationals, (Daimler AG [Mercedes-Benz], Adidas, Bayer Pharmaceuticals..) who have global supply chains and customer channels, and although they may publish accounts in EUR, to all intents and purposes huge proportions of their supply costs and sales receipts are either in USD, or hedged to equivalent. I should say at this point that large corporations who source and sell globally invariably hedge their currency risks by running forex dealing departments the size of a small bank. 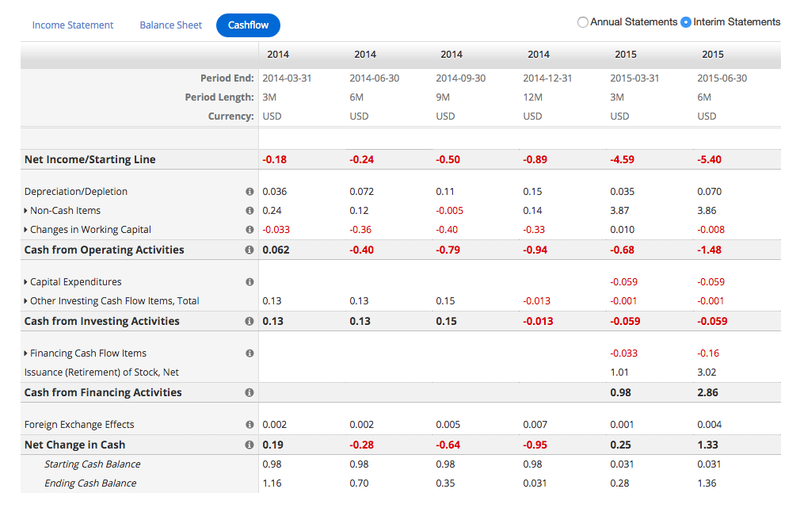 Consider sales in emerging markets, where currencies fluctuate wildly against USD. To meet periodic budget targets and avoid profit warnings, this activity is essential. The point is that the tenuous link between currencies and indices is easily broken by firm news. The FOMC dollar 'euphoria' kept the indices in reverse correlation for the best part of a month. Of course the depressed indices then suggest to the market that there will be no rate rise, and we have seen in the last few days the correlation return. Incidentally, the CME Group have a useful web page which shows the market's sentiment on the likelihood of a rate rise. The current view is almost no chance in October, and only circa 30% chance of a rate rise in December or January. The pattern on these three is similar to the German DAX but not so pronounced. However, because the link is not so strong, there is sometimes a possibility of an index (or the currency) lagging, which presents a low-risk trading opportunity. Consider for example the July price/action on the CAC40, where the index clearly moved ahead of the EUR, whereas the DAX was more or less in lockstep. This time lag is important. If there is great correlation but it is simultaneous, there is no particular advantage, other than the relatively difficult exercise in spotting pivot points (support/resistance) in the currency where none exists in the index, or vice versa. The Swiss market is interesting. 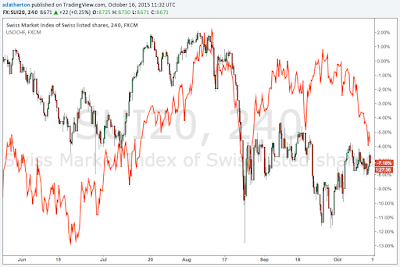 The index is a 'minnow', a small non-volatile index which is hardly traded at all outside Switzerland (i.e. by non-CHF investors). However, the currency is a major safe haven, as seen by the August 24 spike. The chart for this shows poor positive correlation, but does reflect the FOMC dollar 'euphoria' since the September announcement. 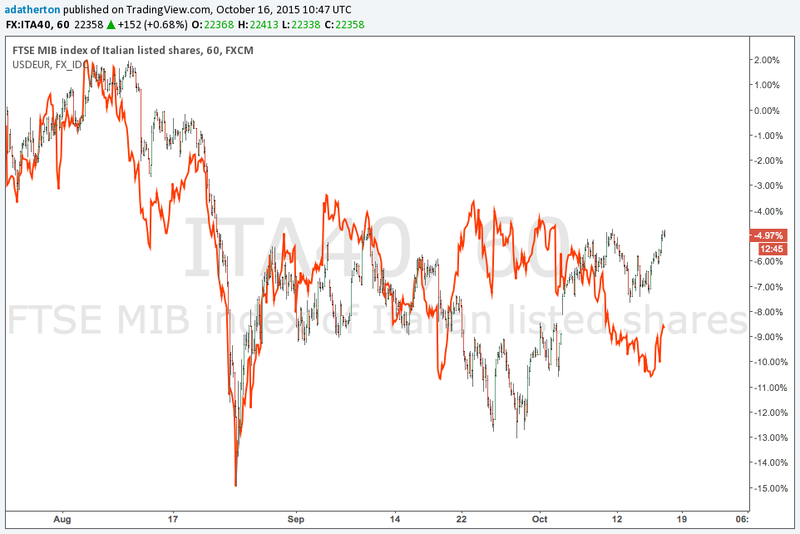 My view is the same as most global traders, the index is irrelevant, and so therefore is correlation. 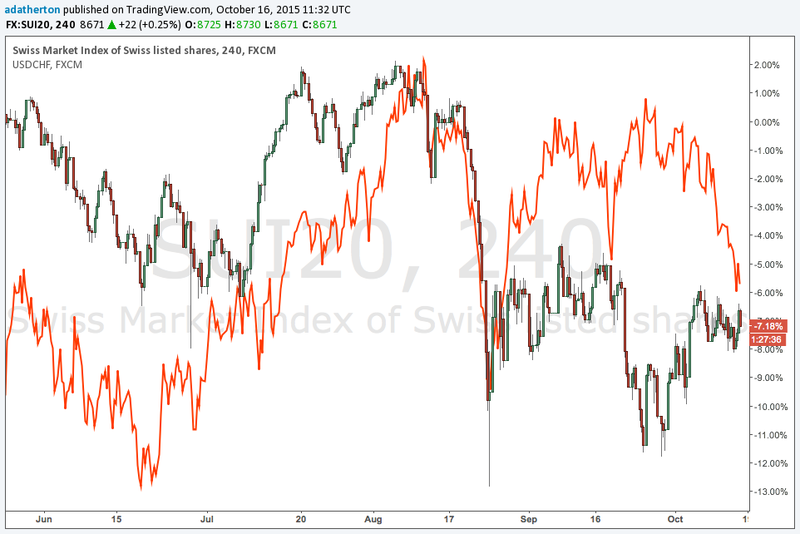 I will pass on the Scandinavians for now, mainly because it's a similar situation to Switzerland, the indices are only lightly traded and not very volatile, and unlike the Swissie, the Scandie currencies are not that volatile either. There is also a very strong link between NOK and the price of oil, which is outside the scope of this article. This leaves the final European denomination, GBP and the FTSE 100. Here's the chart. 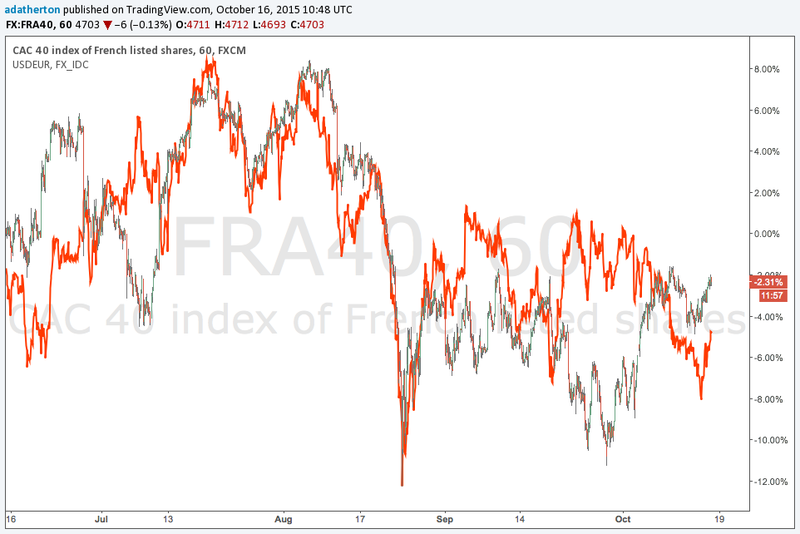 Straight away you should notice some big differences to the EUR comparisons. 1. I have plotted the chart with USD as the quote currency, not the base. 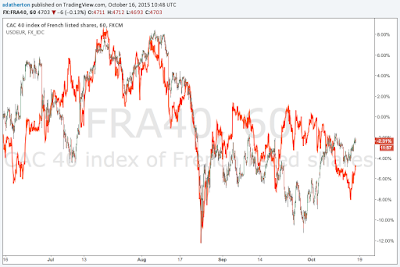 Correlation does exist this way, which is the reverse situation of the Euro. In other words the FTSE quoted in dollars would be even more volatile. 2. Much more importantly, there appears to be a lag between the price/action of the FTSE 100 index and cable. 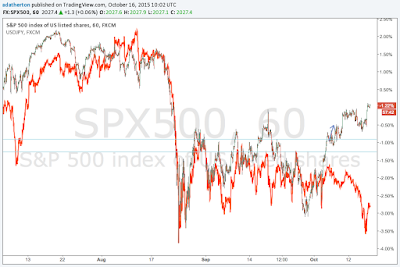 You see this very clearly in the weeks either side of the Aug 24 crash, and again since the beginning of October. This lag of approximately a week is of course a great trading indicator. 3. 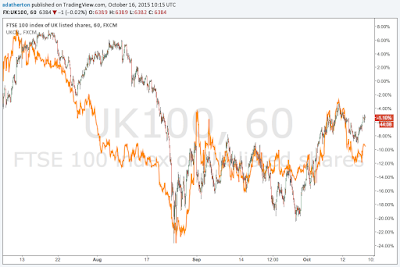 The correlation appears to have 'caught up' as I write on Oct 16, but if not, there is a little further upside to GBP. However, it is definitely worth watching FTSE price action for further clues. Obviously GBP and EUR are very closely linked fundamentally, due to Britain being a member of the EU, and the huge volume of trade that results from that. 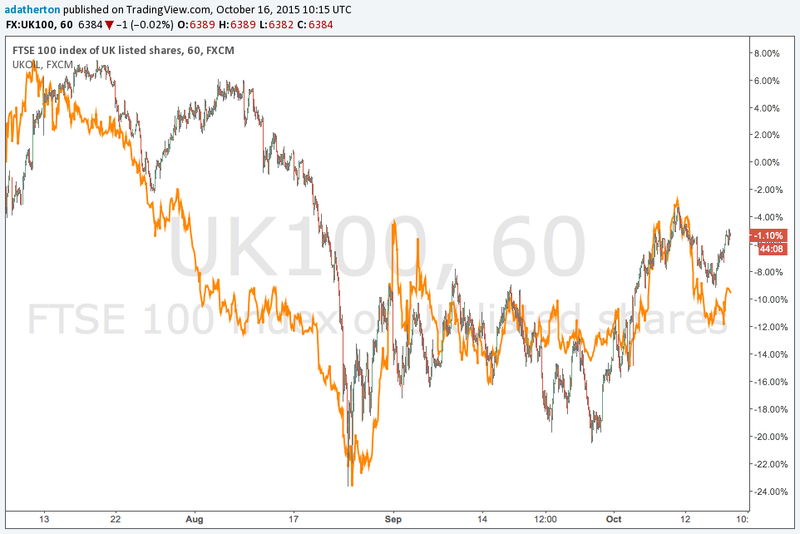 I was going to discuss the relationship between the FTSE 100 and EURUSD, or perhaps the cross pair EURGBP. 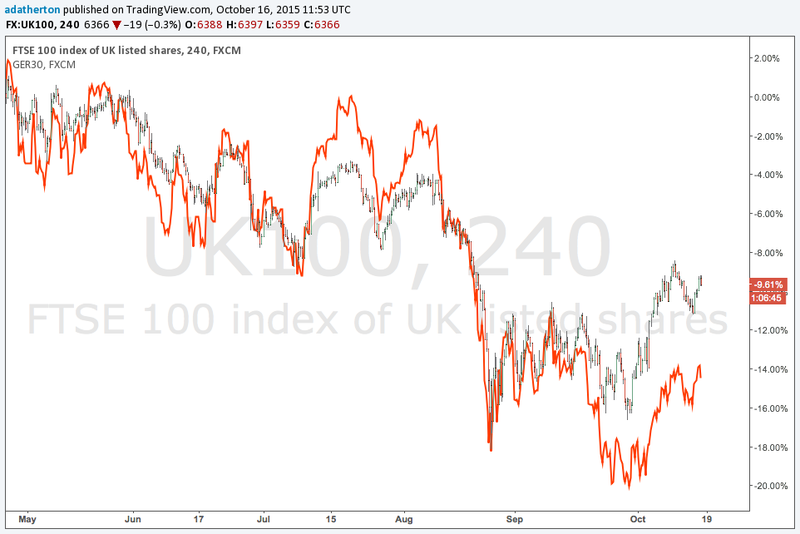 However, to reduce the UK vs Euro point to it's simplest, why not just correlate the FTSE and the DAX which I have done here. 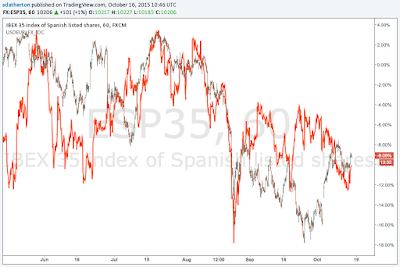 You can see immediately that the correlation is much stronger than any of the currency correlations. So there is really no need to explore further. Once we move outside Europe the only markets of significance are Japan and Australia. This is largely because only these countries have heavily traded and therefore volatile stock markets, and highly traded currencies. India has the former but not the latter, New Zealand has the latter but not the former. Let's look at Japan first. The correlation with USDJPY is very strong. It has been ever since the 2008 crash, when it was not correlated before, as shown on the 20 year chart below. Japan of course is well known for it's closed economy, and, say some economists, the stagnation that results from that. You could also add that the country 'missed the boat' on the internet revolution. 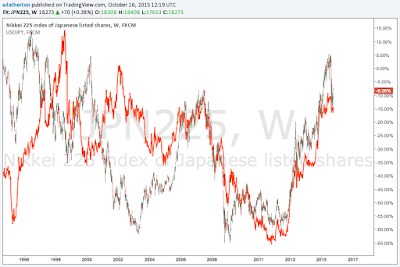 What this means is that Japanese stocks have hardly risen in price in USD terms since the crash of 2008. Contrast this with the 150% rise in the S&P 500 since that date. Australia is not an important stock market, and is dominated by miners, who have suffered from the problems with the collapse in metals prices, led by gold in 2012/13. 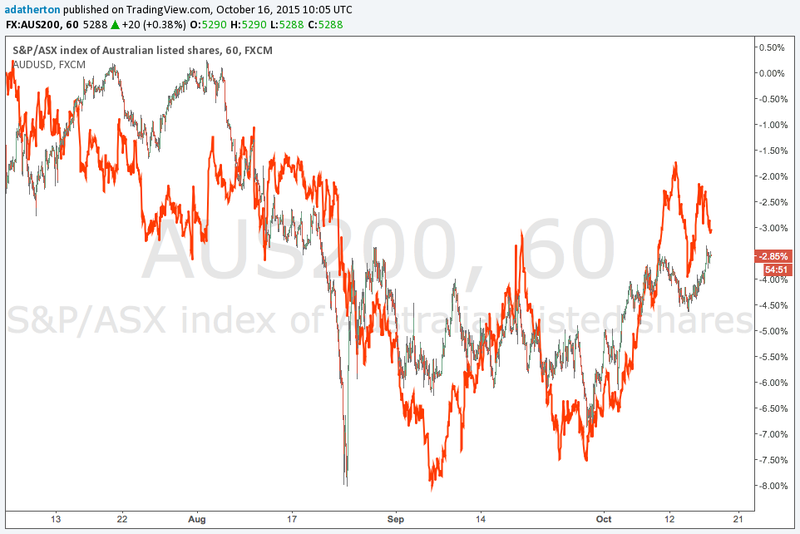 Nevertheless the correlation with AUD exists and like the FTSE has some lagging points, although not as clear, and in some cases the currency leads. 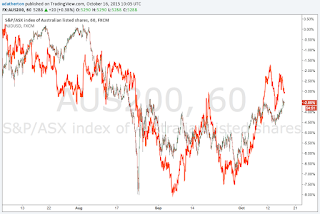 The Aug 24 ASX200 crash took over a week to be replicated in the AUD currency. 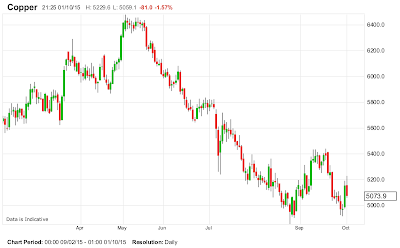 The chart shows a small opportunity to short the ASX over the next few days. Finally we turn to the US itself. Of course we can compare the S&P 500 (SPX) with any pair. Some strange correlations occur. 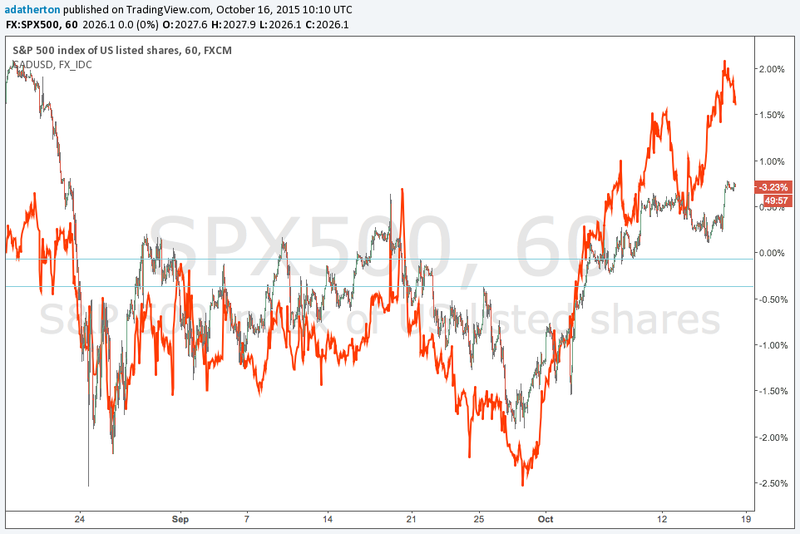 For example look at the SPX compared to CADUSD, again the USD as quote currency. The correlation is strong. 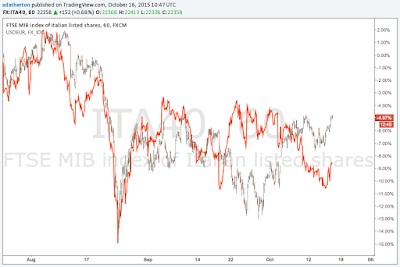 In September the pair led the index (giving trading opportunities on the latter). In October, the index lead for a couple of weeks, but the last couple of days seems to have switched back. This makes spotting any opportunities very difficult. Notice by the way how nothing much happened to CAD on August 24. 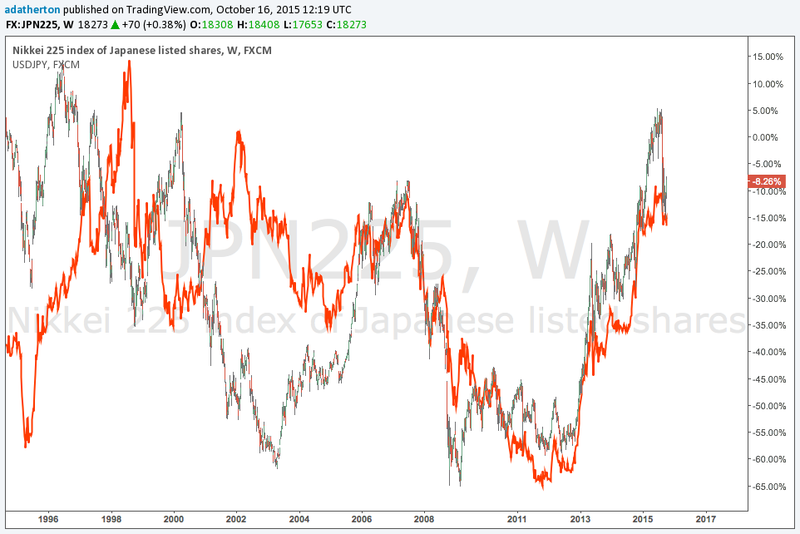 Comparing JPY is even stranger. This time we take the conventional position of USD as base, and JPY as quote. 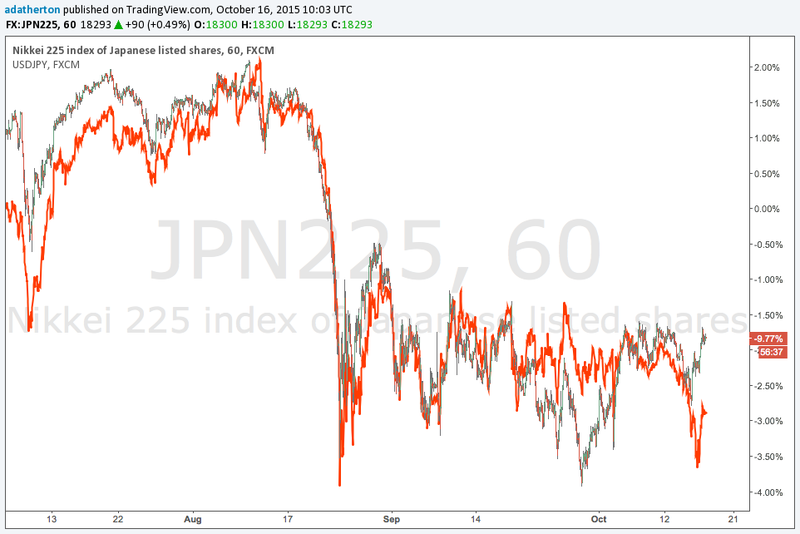 The correlation until the first week of October was very good, reflecting the classic 'flight to JPY' because dollar bearish sentiment ceteris paribus is matched with equity sell-offs. However, since the first week of October, things have gone the other way, almost certainly following the very poor non-farm payroll figures for October. The market has decided that the NFP figure will postpone a rate rise[3 ibid] and consequently the market has risen, whilst the dollar falls. This constant switch from 'good news=good news' to 'bad news=good news' has been a feature of the equity markets since the tapering of QE. Each bad economic data item has caused the market to believe that normal priced money is further and further away. Concomitant to this issue is decay, as the bad economic event recedes, the currencies and markets fall back into lockstep. There seems to be little effect of 'good news=bad news'. In other words, whereas Fed pronouncements and other economic news affect USD in exactly the way you would expect, it seems that almost all economic announcements push the equity market up. This is my view is the reason for the sudden and severe crashes in October 14 and August 15. Only once a rate rise track fully normalises the economy will we see some normality in currency and equity correlation in the markets. My view on the commodity collapse is that prices will recover much more slowly, maybe over 3-4 years, and thus should not affect either the CAD or AUD significantly, nor the relevant indices. My overall conclusion is that currency/index correlations do exist but there are no constant rules, and the correlations only exist in the absence of real 'risk-on/off' significant economic events. Another course post, in reply to another student. I have come a little late to this target, and can't fault your logic with TP1 1.97479 and TP2 1.94274. 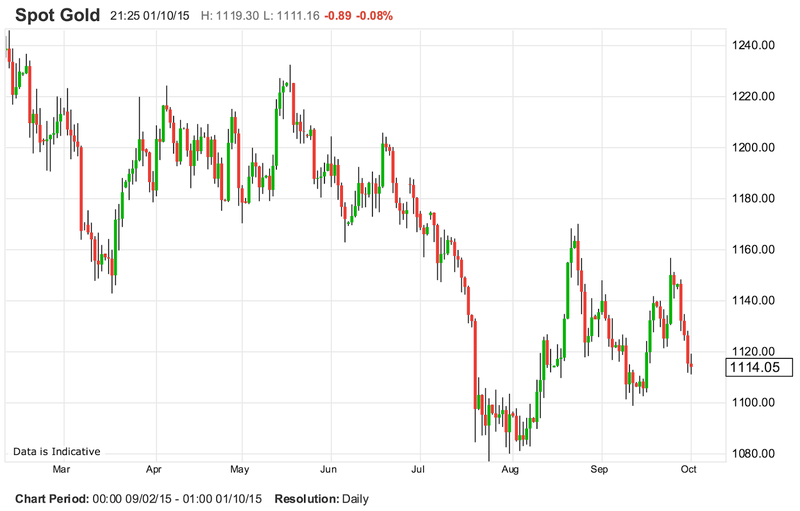 Another post from my course, this time on EURJPY. 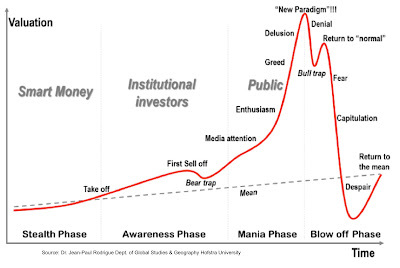 Most people are bullish, but I am more bullish with a pitchfork hypothesis. I am replying to a post from 5 days ago. 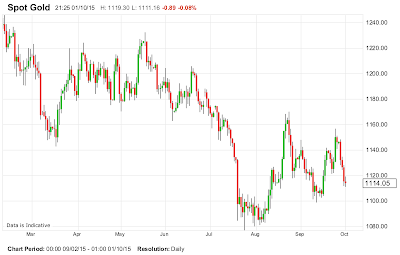 which leads to a target above 138.00, perhaps to the August 21st high of 139.00. Obviously, there is also conventional support/resistance to consider, Support can be taken as the last (spiked) high at 135.75 (red line), and resistance at 137.44 from Sep 17th. Of course if I really believe in the pitchfork, whose channel line stands, as I write at 136.27, then even 136.10 would be an adequate stop-loss. The safe contract doesn't need a pitchfork hypothesis, it is simply rising to the next resistance. The risky contract does, which is why I have included the pitchfork line in the stop. This is very important, if I believe the pair will go to 1.39, I must logically believe in the higher stop. If the safe contract completes correctly (profitably), I have made 82 x 2 = 164 pips, comfortably more than the 47 pips lost if the risky contract fails. Blog reader @unluckyruss (a apt name for an AIM investor!) 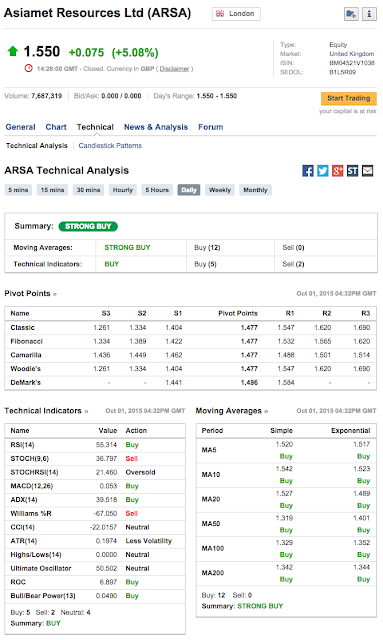 has asked me to do a chart on Asiamet Resources. I am happy to oblige. I have never looked at this before, and am a bit out of my comfort zone with AIM miners. Those two charts are interesting, because you could argue that copper slightly 'behind' gold which hit it's low a month earlier, and say that copper is now where gold was mid-September. This gives an indicator that copper will rise (and fall, but with higher lows). Also copper is traditionally strongly correlated with the Australian dollar, and many FX commentators believe the AUDUSD pair has bottomed after declining all year. The company is, as I say, still exploring, so they have not yet made a profit, or indeed booked any revenue. Hence conventional fundamental metrics are of little use. However, they still have over $1.3M of cash to operate with due to this market placing. However their operating expenses are $800k per 6 months (see http://www.asiametresources.com/i/pdf/2015-Q2.pdf page 20). If cash runs out, there presumably be a rights issues which will dilute existing shareholders. So let's look at the share price. 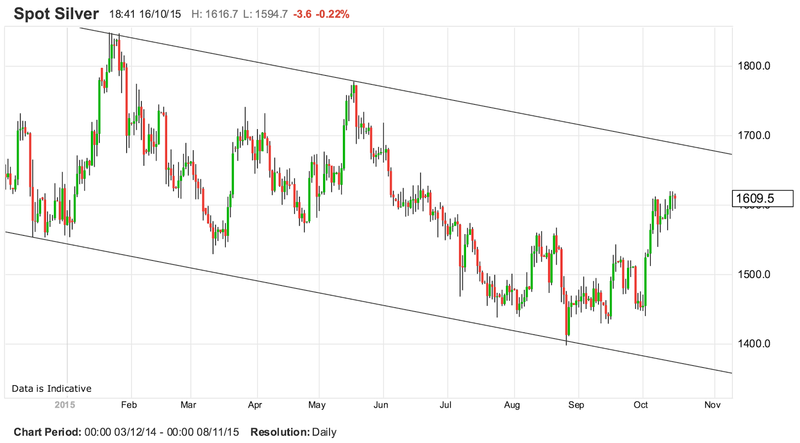 Currently at 1.55p, it is more or less midway in a channel of 1.00p to 1.90p which has held all year. Remember there is no revenue, so as is usually the case with junior miners, everything depends on whether they actually extract any metals before their cash runs out. If they do, then, as always happens, the shares will soar, presumably above the 7p IPO price, even with a rights issue. Rather than go into the likelihood of that, I will direct you at a much more authoritative blog post on the subject here. The author holds a position which I do not. 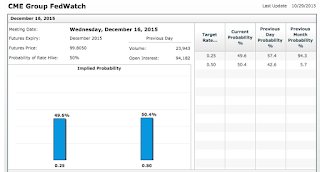 You can take today's price of copper and quickly calculate the potential upside. 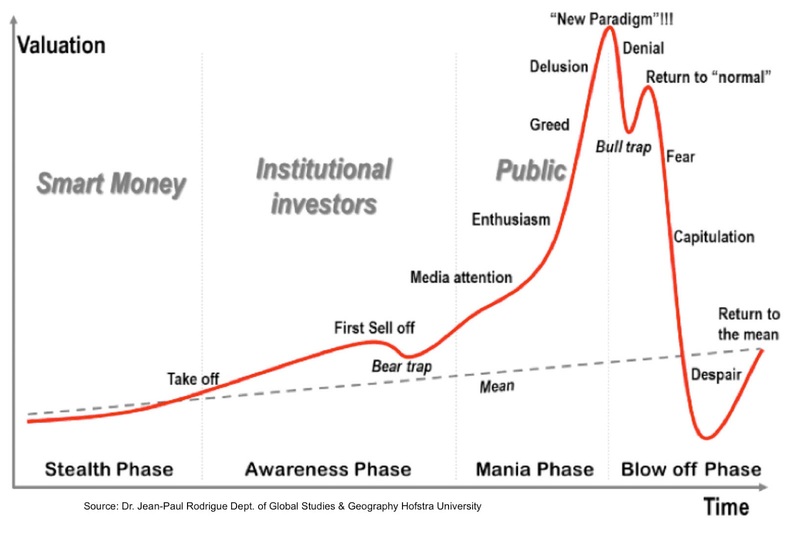 However, @unluckyruss has asked me for a chart, which is the short-term view. Here is the daily chart for the AIM instrument for the last 12 months or so. After falling sharply from around 7p, the share has travelled in a channel all year, spiking occasionally on news and perhaps rumour, with volume never exceeding 10M shares a day. On August 26th 2015, the company announced a high-grade copper zone discovery (http://www.asiametresources.com/s/PressReleases.asp) and the shares spikes as high as 66% above the previous day's close (1.83p vs 1.10p). But that's what it was, a spike. The shares closed the next day at 1.22p. The smart money had got out, leaving the amateur investor buying at the top. There were 81M shares transacted that day, nearly 10 times normal volume. Over the next couple of weeks, there was some recovery, and importantly, the price made higher lows. A further press release on this discovery on September 14th caused another spike, this time to 1.90p a high previously achieved on one day only in January and May earlier that year. This is always a problem with AIM miners and explorers. They issue a positive piece of geological news, the price spikes for one day and then fades. An extreme example was when AIM bȇte noir David Lenigas appeared on BBC News one morning before market open to announce 'Gatwick Oil', the Horse Hill site. Shares in UKOG.L tripled in value at the open, but within the hour it was all over, and they were more or less back to where they started. Price movement in low liquidity markets is can only be driven by volume. If you look at the chart, you can see that all the volume up to the second press release was only one-and-a-half times the volume of the August 26th trading day. The volume was still greatly in excess of the pre-August 26th average daily volume, and so the price rose gently. The September 14th release didn't have anything like the earlier volume, but on the other hand the existing volume had pushed the price up. (In other words, investors had already got in early, for once). The spike this time, from 1.40 to 1.90 was only 35%, but this time, the price held better in subsequent days. We now come to a third press release on the same subject, issued on September 29th. I am not a geologist, so I don't know the significance of the release contents, but I imagine there is nothing new in it, because it really had no effect on the price at all. You can also see the volume falling. The total shares traded since the September 14th announcement is 53M, and falling. Some people are now getting out, but the majority are regarding this as momentum which it is. Nevertheless the falling volume is accompanied with a slight fall in price. The price is now forming a bullish ascending triangle, the ascending line being the hypotenuse, and the adjacent line being the 1.90p 'high of year' price. Technical theory suggests that the price will rise to the adjacent line and then break out above it. The share is currently 1.50p/1.60p and if it reaches 1.90p, will be presumably offered at 1.85p/1.95p. It is a strong possibility that the price will reach there again. This offers a low-risk gain of 0.25p per share. There are some technical signs which are better still. The last spike before the August release allows us to draw a parallel ascending channel which takes the price smoothly above 1.90p. 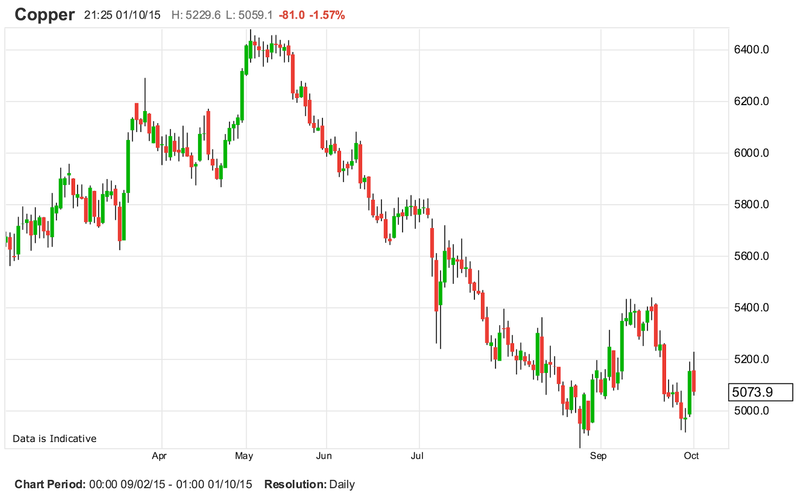 There was a spike in January to 2.20p, and this is a possibility. I must stress though that 1.90p has been touched twice more recently, and so is definitely resistance. What this means in practice is that a lot of professional investors will have noticed these two highs, and have limit orders to sell already set up at 1.90p (or 1.85p because of the bid/offer). The slight fall in price is not too worrying, as the red line shown for the last few days on the chart is the start of a symmetrical bullish pennant, as indicated on the chart. In fact a pennant gives a clue to a potential rise. The theory is that upon resolution of the pennant, the price will rise by the entry 'height' (called the flagpole) of about 0.4p. The pennant resolves at 1.60p, giving a final price of 2.00p. However flagpole height gains are easily trumped by strong resistance, and I would just regard it as another signal to reach 1.90p. In fact because this technical indicator is not strong, if the price does rise to 2.00p, I would stay in until 2.2p - without further news. 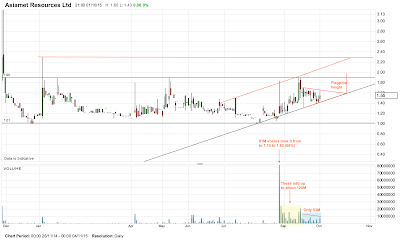 Will it break out above 1.90p. In my opinion no, unless there is even better news than that given in the last three releases. 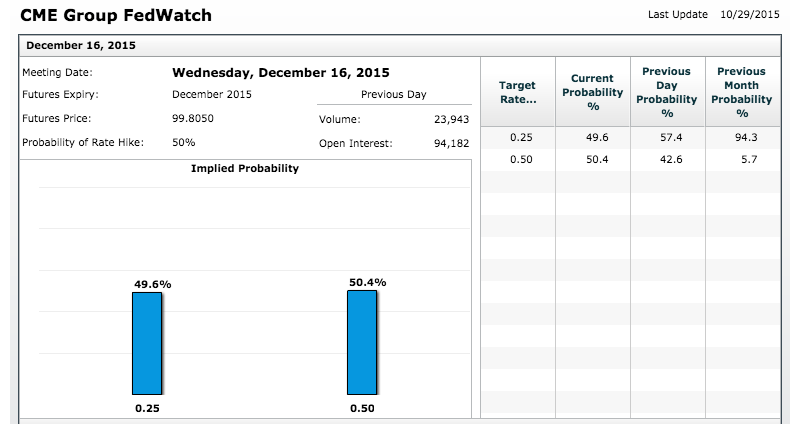 The market knows the BKM mine is good. The next step is to say something even better, and for that matter address the cash burn issues. The technical momentum is good for 1.90p, but in mining, no news is bad news, and the volume and thus the price will start to decay again. If I were Asiamet, I would time my next news release to be out in early November, which is where the ascending line touches the 1.90p resistance! If no such news arrives by then, you can expect a slow decay in the price, back to 1.00p. Of course the next release may well be a rights issue, which will change everything. By the way, the director buy on September 1st was slightly helpful, but at £45,000, it was not really very important. 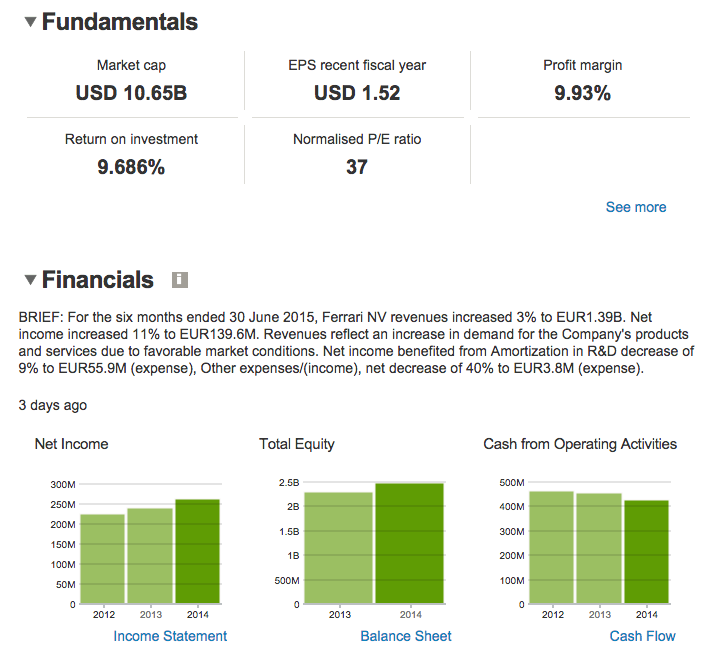 Many people don't realise that investing.com (in my opinion the most useful site in the whole business), isn't just for FX and the big indices, but does cover many UK micro-cap stocks. Here's their summary at the time of writing, and it's a strong buy on all timeframes.